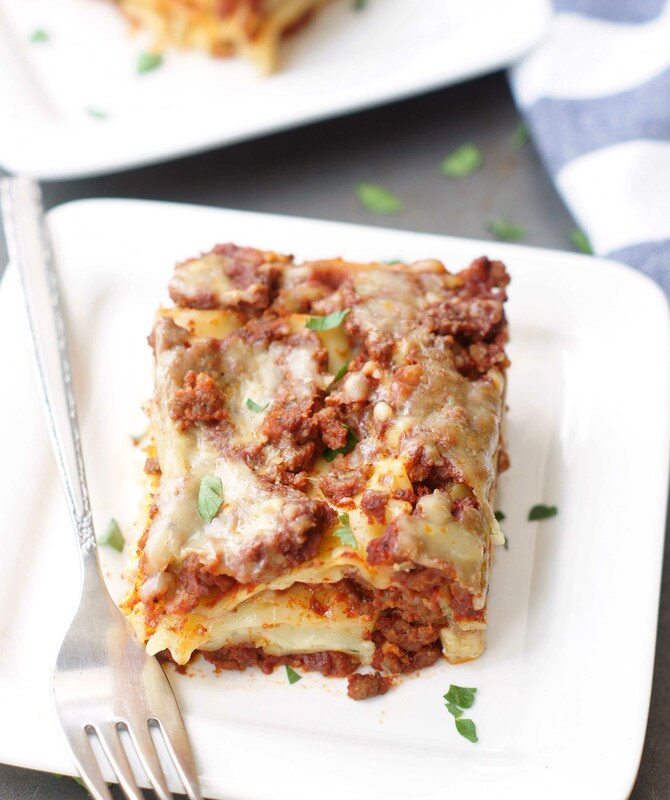 This Classic Lasagna is packed with flavor and layered with lots of cheese. It’s ahh-mazing! It’s our family favorite and hopefully, will become yours too. 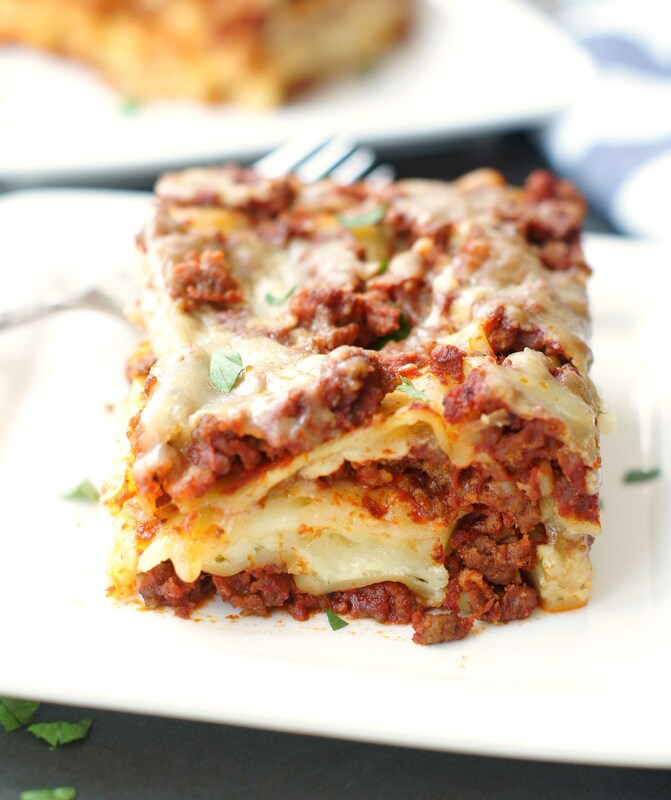 Lasagna is probably one of my all-time favorite pasta dishes. It’s filling, comforting and tastes even better the second day, which always makes dinner the next night super simple. I’ve been making this recipe for years. I got it out of an old issue of Taste of Home, made some changes and now it’s my go-to lasagna recipe most of the time, unless I’m making my mother-in-laws which is completely different than this one. I’ll share that another time because it’s soooo good too! One of the changes I made to this recipe is I don’t cook the noodles and I don’t even use the no-boil noodles. Does that make me lazy? I don’t think so, it makes me smart because it eliminates a step. If you plan ahead and make this the night before, cover it with foil and then keep it covered the first 60 minutes of baking, then the noodles turn out perfectly. Feel free to cook your noodles or use no-boil, it’s completely up to you. One of my favorites things about this lasagna is the layer of provolone cheese. . . .hello!! As if grated mozzarella cheese weren’t enough, you go and add a layer or provolone, now that’s completely 100% delicious. I made this a few weeks ago and had my parent’s over and they were oohing and ahhing over it. I’ve decided that I’m always so busy looking for and trying new recipes, the old classics seem to get forgotten. Sorry, lasagna, it won’t happen again. In a large skillet over medium heat, cook ground beef and sausage until no longer pink; drain grease. Add tomato sauce, tomato paste, garlic, sugar, Italian seasoning, rosemary, salt and pepper. Bring to a boil. Reduce heat and simmer, uncovered for 30 mins, stirring occasionally. While sauce simmers, in a large bowl lightly beat the eggs then add parsley, cottage cheese, and Parmesan cheese. Mix well. Preheat oven to 375°. Spread 1 cup meat sauce in an ungreased 13x9-in. baking dish. Layer with three noodles, 2 cups cottage cheese mixture, provolone cheese slices, 1 cup mozzarella, three noodles, 2 cups meat sauce, remaining cottage cheese mixture and 1 cup mozzarella. Top with remaining noodles, meat sauce and mozzarella (dish will be full). I always make this the night before and DO NOT cook the noodles (I just use regular noodles, not the no-boil kind). I cover it with foil and refrigerate it overnight. The noodles begin to soften overnight and then by baking it covered with foil for the first hour, they turn out perfectly. This saves me the time and hassle of having to boil the noodles and I love making it the night before so it's already to throw in the oven the day I serve it. If you make this the day of, then make sure you boil the noodles before hand or use the no-boil noodles. Hi Kathleen! Thank you for the sweet comment. This lasagna is amazing, I hope you have a chance to make it. I’m definitely not superwoman, I wish I was! I’m glad I’m making you hungry and thanks for subscribing. I’d love to hear back from you anytime you make anything! Thanks again for taking the time to leave a comment. I’ve tried several of your recipes and they are great! 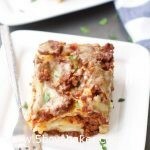 I’ve been wanting to try your classic lasagna for some time now. I’m planning to make it the next few days. I wanted to clarify about the make ahead instructions. You don’t need to boil the noodles ahead if you make it a day in advance? Do you have to buy no boil noodles then? I couldn’t believe you just put raw noodles down, and it could be that easy! Hi Jodi! (great name!). I’m so glad you’ve loved my recipes, thanks for trying them. For the lasagna just use regular noodles, not the “no boil” noodles. It is so great because I hate boiling lasagna noodles, I don’t know why. Just make it the night before, cover it with foil and put it in the fridge overnight. Keep it covered with foil while it bakes the first 60 minutes. The noodles are absolutely perfect. This lasagna is my all-time favorite. Whenever I make it or take it somewhere I always get asked for the recipe. Good luck! I hope you keep coming back. Hi Jodi…if you cook the noodles the day if, yldo you still need to cover and bake for the same amount of time? Hi! Yes, still cook it for the same amount of time. Let me know how it turns out for you.